When properly controlled, measurements of upper airway resistance can provide a global assessment of the effect of changes in upper airway muscle activity on upper airway function. Figure 4. Changes in upper airway resistance in the breaths preceding an obstructive apnea in nonrapid eye movement sleep. 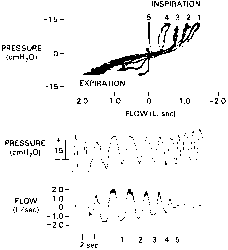 The supraglottic pressure-flow plot shows a progressive increase in inspiratory resistance, i.e., narrowing of the pharyngeal airway, on the four breaths preceding complete airway closure on inspiration (breath 5). Upper airway resistance is only an indirect measurement of upper airway muscle activity. Measurements must be carefully controlled as upper airway resistance can be affected by many other factors (see previous sections). Measurement of upper airway resistance requires an invasive procedure that is of low morbidity. The determination of upper airway resistance is a clinical research technique that has been used to assess the effect of changes in chemical drive and sleep-wakefulness states on upper airway size and muscle activity. Nasal rhinometry, the measurement of nasal airway resistance, is used by ear, nose, and throat physicians to assess the patency of the nasal passages.